"Penny Thieme, Roeland Park, Ks paints her life in pulsating imagery resplendent with symbolism, vibrant colors and passages that meander through the psyche and connect soulfully to the human condition." Internal Drive: Penny Thieme "Oracles and Vessels"
of beats slowed ... stilled. we carry the seeds of the second chance. "I am very impressed with your body of work. It has been a while since I have seen work fresher than yours. These are powerful. I am sure they will stand on their own as the finest oil paintings around. You deserve all this praise, these are some of the most incredible paintings I have seen in a long long time. Many more accolades are coming your way and you fully deserve them all." "The first time that I saw Penny's art I didn't get it. I thought she was morbid, that her graphic depiction of human hearts was like being thrust into a lab session of a gross anatomy class. I saw a cadaver laid bare on a huge canvas that I couldn't look away from. I watched her paint, began to see her body of work, and my mind changed. I don't see her work in such terms anymore. Her paintings don't ask what you think. Her paintings ask what you see. There is a living thing in front of you. It breathes, it processes, and it feels only one thing. It is that one thing, that secret, that you are tasked to answer in each painting and they are all very different and intensely specific. Her bright, intense colors don't play around. Whatever you are shown, it can't hide itself. It is three dimensional and fully exposed. The spotlight is squarely on a very tenuous, fragile, yet unabashedly female emotional idea or ideal. Her paintings are substantial, widen the pupils, fill the brain with a kind of "meatiness" that is unlike anything I have seen before. I think it is beautiful in a way that has to be pondered over to be embraced; and to me that is what good art should be." The “Weathering Veins” exhibit at Familiar Faces Gallery is a series of paintings by local artist Penny Thieme. This collection was created over a span of about two years, but the stories and emotions intertwined in the brushstrokes were a long time coming. Penny spent four years attending Johnson County Community College from 1989 to 1992, discovering her passion for art. She then went on to Kansas University to further explore this passion, only to find that the classes stifled her creativity. This, in combination with discouraging voices in her life, convinced her to be “practical” and leave art behind.(2). Little did she know that she would later express her next experiences on canvas. “Weathering Veins” is a “metaphor for the cycles of life and all that it means to be human.”(3). Penny explores the idea that humans are living and dying at the same time, and that they are always morphing from the experiences of the past and present. “The weathering effects of life’s elements are constantly reshaping and coloring who we are and how we view the world. The homophones vein, vain, and vane represent our physical, psychological, and spiritual nature and their subjugation to life itself.”(3). The viewers get an idea of her exploration and symbolism by reading the pamphlet of the show available in the front of the gallery. Without this insight, viewers may just see the paintings as their literal images: human hearts and veins, without experiencing the depth of her storytelling. Penny is very expressionistic in her style, but uses representational imagery to convey emotion. These works are oil/mixed media on canvas. There are three works that made the strongest impression on me as I walked through the gallery. The first was a 60x48" painting titled, “Regeneration”. The formal aspects of this painting grabbed my attention initially. The use of complementary color and vibrant hues make this painting feel alive: the threads of veins appear to move and pulse. Then I realized the image appears to be a headless torso, to which Penny responded, “To some this piece is gruesome, a headless torso, but others may see life emerging from a barren landscape, something beautiful from within that which would otherwise appear dead.”(2). At the very heart of the painting is a heart that seems to be growing and regenerating from this dead stump. Not only does this imagery represent the artist’s growing from the experiences of death and grief, but it asks the viewer if they continue to grow in spite of life’s dead ends. “Regeneration” asked me to reflect on my own growth from life’s experiences. The next piece that really captured my soul was her painting, “Ego”, on a 40”x30” canvas. 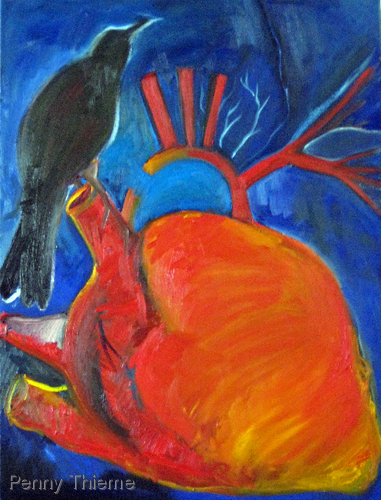 An image of a crow seems to be pecking away at a human heart, which creates an eerie, dark feeling. The bright, vibrant colors on the contrary make the viewer confused, as the use of color and loose brushstrokes evoke a happier emotion. In reality, this painting represents life, not death. Penny began to have a dance with bird imagery in reflection to her life in the business world before her mother became ill. During a time in her life when she felt she was trying to be someone that everyone else wanted her to be except herself. On her way to work everyday, a crow would call out in the same place on her route, and she felt it was talking to her. She began answering his call with her own “caw”. “The crow was a spiritual guide in a time in my life when I’d lost myself.”(2). Penny now uses crows in her paintings to represent moments of spiritual growth and change. 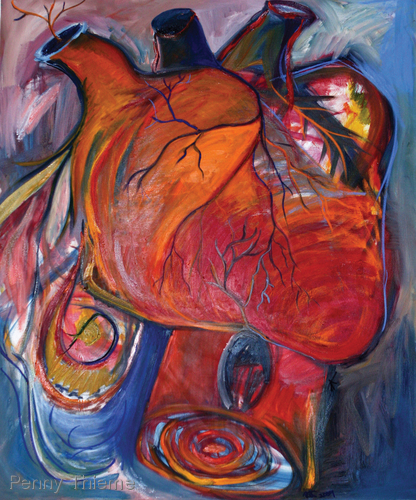 The underlying repetitive image of the human heart in this exhibit represents penny herself. “Through doing many self portraits I realized my face is shaped like a heart. That was the beginning of the heart imagery. It was a way for me to be present conceptually. It is more likely the crow eating away at my ego is showing me who I really want to be.”(2). I then asked myself, “What is my spiritual crow eating at?” Some viewers may not want to face this answer, which may be why some can only see the surface image of the crow on the heart. 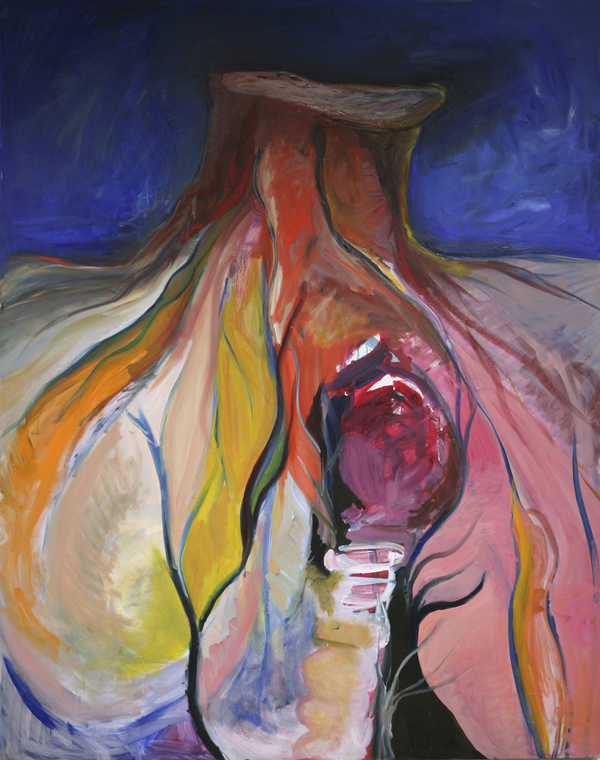 "All of a sudden I wasn’t someone’s daughter, wife, or granddaughter, I was faced with just me, and I grew.”(2) This painting came in acceptance of her parents’ death and intollerable issues in her marriage, resembling the connect and disconnect to things in the pathway of life and consciousness. As the viewer, I felt that the heart at this moment is full of life, and prosperous in health. This exhibit of Penny’s recent work was the beginning of her own language as an artist. “It’s the beginning of my own alphabet, and I want and hope to make words and then sentences, and eventually a story of my life , celebrating where I have been and who I am becoming.”(2). Not only is Penny forming her alphabet, but she has begun to ask those who view her work to jump into her paintings and explore themselves. Penny has achieved viewer exploration and reflection by the realization of this concept: “Making art is more about conception. The act of creation is very different in that it is born out of isolation and demands times of solitude and personal reflection. It speaks of personal experiences and connection to myself.”(1). A fellow local artist, Bridget Stewart, had said of the Weathering Veins exhibit: “Penny Thieme’s work reflects her open mind and heart. She creates expansive spaces through shape and color which entice and enfold the viewer. Her work has the quality of speaking both a “macro” view of the universe and a “micro” study of specific times, places and emotions. Her work gives us a safe place to contemplate the harder questions, doubts and hopes that define our humanity.”(3). Certainly this is why I felt that the exhibit had significant meaning and had earned its place in the Modern/Contemporary Art World. The abstract mixed media works of the “Weathering Veins” exhibit by Penny Thieme opened March 27th, 2009 at the Familiar Faces Gallery in Overland Park, Kansas, and will be shown through April 26th, 2009. This exhibit is one that needs to be on your “must see” list, but it is not for the faint of heart. Do not attend if you are not ready to take a look into your own soul. But if you do get up the courage to view these pieces, you may have a welcomed visit by a crow. 1) Thieme, Penny. “Artist’s Bio”. Penny Thieme. Artspan.com. Mar. 2009. .
2) Thieme, Penny. Personal interview. 19 Apr. 2009. 3) Thieme, Penny. Familiar Faces Gallery. 2009.